This feature originally ran in October, 2015. We resurrect it as Halloween creeps closer and the Goosebumps sequel hits theaters. Rank and File finds us sorting through an exhaustive, comprehensive body of work or collection of pop-culture artifacts. This time, our spines tingle as we revisit R.L. 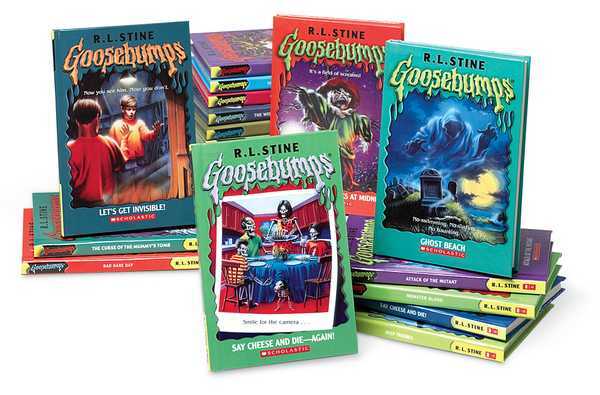 Stine’s original Goosebumps books. Little could we have known when the 10 of us gathered together to rank R.L. Stine’s original run of spooky children’s page-turners that we would be changed … er, should I say, altered, possibly forever. It was a crisp fall evening in our small nothing-ever-happens-here hamlet of Chicago. Nine of us walked in a parade of blue jeans and hooded sweatshirts, our sneakers kicking at pebbles and crunching atop leaves as we made our way to the Consequence of Sound offices. We had just seen the new Goosebumps movie together and couldn’t wait to hunker down with our staff list. Nothing about the night hinted at the strange events to come. We sat around our conference table, chattering away like usual. Sean recalled ordering Goosebumps and novelized episodes of Family Matters through Scholastic Weekly Reader brochures. Alex bragged that reading and re-reading Goosebumps books had earned him more than 100 personal pizzas through the Pizza Hut BOOK IT! program. Our film critics, Randall and Dominick, argued that Stine was responsible for teaching a whole generation of horror fans the basic beats and twists of scary movies, not to mention the utter dread of tired sequels (“There was a Monster Blood IV!?!?”). Even when our tenth, Dan, finally arrived, dark sunglasses on and a denim jacket flung over his shoulder, and declared, “I came here to do two things: drink some beer and rank some Goosebumps,” we thought nothing of it. After all, Dan always said that. “It would be pretty cool, though, right?” chimed in Nick. “That wasn’t the f-word I reached fa-fa-for!” stammered Adam, a worried look sweeping across his face. As I wiped the slime from my eyelids, I saw the dreadful magic the ooze had worked. The ruggedly handsome music and film journalists I called my friends had been transformed into a gaggle of ghastly, mutated creatures, all fur, fangs, and froth – and that doesn’t even count Steven, who had turned invisible! “Wow, it really was Monster Blood,” I said. “Dunt ve a dummy,” said Dominick, his teeth gleaming sharply as he ogled Sean’s neck. “Who are you calling a dummy!” I yelled, a strange clacking sound coming when my lips closed, like two blocks of wood smacking together. It was then that I noticed how much taller everyone was than me now. I slowly raised my hand and found five wooden fingers stiffly wiggling in front of me. “Then what is this gunk?” asked Nick, throwing his tentacles up in frustration. And that brings us to the present, but it’s not the end of our story by any means. Only you can decide whether we’ll ever become our beautiful selves again or if we’ll remain horrible beasts for the rest of our unnatural lives. Let us know in the comments section below. In the meantime, we’ll be waiting for you, just like R.L. Stine’s books always were: slithering, howling, and ready to give you, well, goosebumps.